Goldman Casino will then reward you with a bonus (Welcome Bonus is for new players only). The terms and conditions of the bonuses vary between different casinos and might also change over time and between different countries, so it is important to compare the different offers and read the T&C for Goldman Casino before signing up. 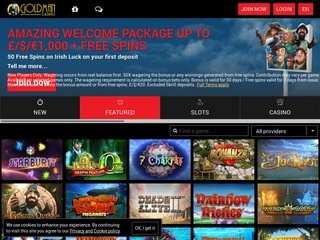 GoldMan Casino is a ProgressPlay Ltd operated online casino, designed to be compatible with mobile devices and played directly from the user’s browser. The regulatory bodies that control the legal and ethical side of the casino are MGA and UK Gambling Commission, contributing to the operator’s aspiration to provide a safe environment with the high quality games to the visitors. 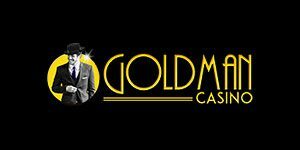 GoldMan casino members can therefore rest assured that their personal information will be protected by the casino, along with all the sensitive data and documents submitted to the casino as a part of the withdrawal verification procedure. The visual appearance of the website is a bit traditional, which is particularly noticeable when you compare the site to some of the recently launched online casinos. For GoldMan casino, the operator opted for an elegant looking background, accenting a more refined side of gambling. Looking at the casino’s VIP membership requirements, it seems that they are targeting passionate and dedicated online gamblers who know exactly what they want – professional venue with a well elaborated offer to their loyal members. Even the welcome bonus is above average and any player who opens an account with GoldMan and submits the first deposit will instantly unlock the promotional offer and receive cash bonus on their casino account, without using any codes or requesting the bonus activation from the casino. Obviously, slots have their own category, but you can also find them under Jackpot, Featured or New. The GoldMan casino gives you the option of saving all your favourite games, storing them under a separate category which you can later re-visit and edit the list of bookmarked releases. If you would like to see what is ranking well with your peers, Featured category keeps the all-time favourites gathered into one place and slots such as Koi Princess, Game of Thrones, Warlords Crystals of Power, Jurassic World and other releases that gained an enormous amount of popularity in the last decade can be found safely tucked in under this tab. If you ever get nostalgic for a more traditional casino offer, you will find that GoldMan has a pretty decent card and table games selection, starting from classic Blackjack, Roulette, Baccarat and Poker variants, to original releases such as Mike Tyson Roulette, 3D Roulette, Roulette Master, Premier Roulette Diamond Edition and others. GoldMan casino has an extra category called Casual, where the players can find Bingo, Keno, Lotto and a few unconventional slot variants such as Sunset Delight and Turning Totems. As already mentioned, Scratchcard games have a different category altogether. If you would like to hit the live tables and get the taste of how things are done in the brick and mortar casinos, you will need to open an account, since this category does not allow demo play. It will definitely be worth your time, considering the fact that the live tables are powered by NetEnt and Extreme Live Gaming, experienced live software providers with supreme, highly interactive gaming platforms. Deposits can be placed in €, kr, $ and £, by phone or via Visa, MasterCard, Maestro, Neteller, Skrill, iDeal, Sofort, Giropay, Paysafecard, Trustly, Qiwi, WebMoney, Euteller and Bank Transfer. The available methods will depend on the user’s location and the casino will list all the accepted options for a specific territory during the registration process. The depositing minimum is €20 while the maximum is limited at €5,000. Withdrawals will start at the same amount, with a €3,000 weekly and €6,000 monthly limit. The processing time is no more than one business day and the time necessary for the money to reach the member’s private account will vary from 1 to 10 business, depending on the method used. For assistance and inquiries, you may use a live chat or email option, with agents at your disposal 24/7. The representatives are very helpful and their level of professionalism and efficiency can be rated after the chat session is over. Diamond VIP members will have their own account managers who will take care of their inquires personally. Another way to seek help would be browsing through the casino’s FAQ section as all the information you could possibly need is already provided there; on the other hand, the agents are such a pleasure to work with, it would truly be a shame not to take advantage of it.